By switching to organic, human-grade, and/or USDA certified organic pet food, youâ€™ll be doing your part to help not just pets, but our planet, too. Supporting organic farming keeps pesticides out of the soil and waterways. Plus, your four-legged companion will enjoy better digestion, improved skin, higher energy, reduced allergies, and more. 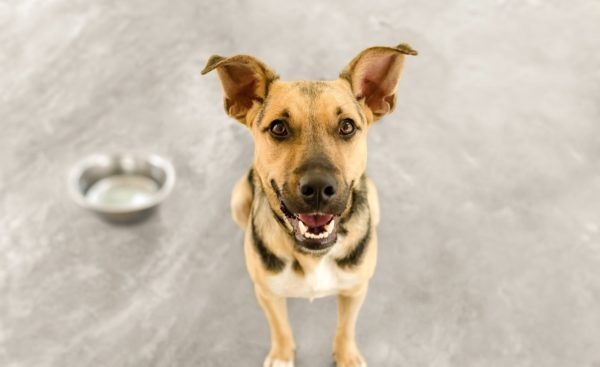 Here are nine woof-worthy dog food brands that deserve a paw up for their efforts to create human-grade quality ingredients while avoiding â€œmeat and bone mealâ€� and other toxic ingredients. The vegan, organic Newman-Oâ€™s Oreo-style cookies may be as familiar to your sweet tooth as they are mine, but did you know that the Newmanâ€™s Own Organics line of wet and dry dog food doesnâ€™t contain genetically modified organisms (GMOs)? And, because over 70 percent of all Newmanâ€™s Own ingredients are organic, they are produced without the use of herbicides, pesticides or artificial fertilizers, or chemical additives or preservatives. Some of their ingredients include human-grade all-natural chicken, organic brown rice, and probiotics. While not organic, The Honest Kitchenâ€˜s U.S.-made pet food is all-natural, 100 percent human-grade pet food that incorporates dehydrated whole foods. The Honest Promise means no by-products, fillers, additives or preservatives, 4D meats, feathers, corn, wheat, soy, GMOs, or ingredients from China. Howâ€™s that for honest? Made in the U.S. in an organically certified kitchen, ORGANIX raised the pet-food bar in 2017 by making their dog and cat food the only complete line of USDA organically certified pet food. The line is created without synthetic pesticides or fertilizers, GMOs, antibiotics, or artificial preservatives. Plus, the food contains no allergens such as corn, wheat, or soy. Youâ€™ll find free-range chicken and turkey and a powerful punch of superfood blends. And did I mention theyâ€™re Non-GMO Project verified? Yeah, that too. From farm-to-Fido, this line of human-grade dog food is pre-portioned and perfect for dog owners who want homemade cooked food delivered right to their door within a few days of preparation â€” never frozen or stored on shelves. Cooked in a New York kitchen, The Farmerâ€™s Dog uses no high starch or artificial ingredients. Theyâ€™ll even help you personalize your petâ€™s meal plan. Hmm, now thatâ€™s what I call a pampered pooch. Hereâ€™s a new buzzword, farm-to-fridge, and itâ€™s coming to a home near you. Made in the U.S., Freshpet offers all-natural, locally-sourced meals for your canine. They use 100 percent natural, farm-raised poultry, beef, and fish that wonâ€™t be found on a shelf. Look for it in the refrigerated section of your grocery store. All-natural, antibiotic- and preservative-free, with no artificial or chemical preservatives, BHA, propylene glycol, flavors, or colors, Freshpet also offers a line of grain-free recipes and single protein sources without fillers for your furry friends who suffer from allergies. They even use wind energy at their facility to reduce carbon emissions. This natural pet food line offers whole food ingredients created by holistic veterinarians. I and Love and You uses natural ingredients that contain no grain allergens such as corn, wheat, soy, or fillers like rice and white potatoes and no artificial flavors, colors, artificial preservatives, or by-product meals. They even use freeze-drying to preserve the nutrients in a raw food line called, Stir and Boom. How about a brand that offers 95 percent organically sourced ingredients? If that isnâ€™t enough to make your dog sit up, maybe this will. Their line of USDA-certified organic pet food offers humanely raised antibiotic and hormone-free protein, and sustainably certified fish. Tender & True has a complete line of organic certified products made with no artificial preservatives, colors, or flavors. The company proudly partners with the Global Animal Partnership (GAP) to ensure the welfare of their animals. Did I mention theyâ€™re made in the U.S.? Howâ€™s that for farm-to-bowl? Only Natural Pet offers Mindful Meals sustainable dog food. With free-range meat and sustainably caught fish, the company is 100 percent carbon neutral. Certified humane and grain-free, they skip the synthetic vitamins and minerals, artificial colors, preservatives, and fillers. All of the produce used in Mindful Meals is GMO-free. Even the packaging uses a USDA-certified bio-based plant material. If homemade dog food is what youâ€™re seeking, look no further than Dr. Harveyâ€™s Miracle Dog Food. Just add meat and oil to the organic grains and dehydrated vegetables for a complete meal. Proudly sourced and made in the U.S., Dr. Harveyâ€™s line uses only organic and human-grade ingredients, with no dyes, preservatives, chemicals, coloring agents, or artificial flavors. Oh, and they also offer a grain-free, vegetarian line as well for your companion animal.